Good evening. I'm a little late with today's update. I've had a week full of reading due to the Bout of Books Read-a-Thon. I didn't read as much as I had hoped, but I did get a lot more reading done than usual. 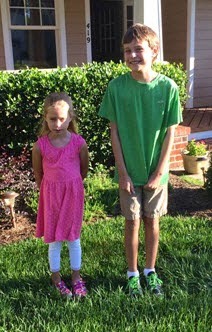 Today was the first day of school for my kids. C started 5th grade and M started 2nd. They both had good days, but we're already having to juggle homework and afterschool activities. At the moment they're outside playing with friends even though they should be doing homework and practicing piano. I just can't bring myself to make them come inside yet! Aside from the Bout of Books postings, I also wrote a review of The House We Grew Up In by Lisa Jewell. I was hoping to get a couple other reviews written, but it didn't happen. I finished The Beach House by Mary Alice Monroe, which is my August book club selection. We'll be discussing it later this week. And I've made it through about half of The Bone Seeker by M.J. McGrath. I'll admit I'm still struggling a bit with this one, but I'm trying to stick with it. C is reading Cold Cereal by Adam Rex. M read Lucky Stars #1: Wish Upon a Friend by Phoebe Bright and will be starting the next in the series tomorrow (when it arrives from Amazon). Luckily the homework wasn't too bad last night. M had to collect things that represent her and C had to do math homework since he's doing an online class this year. I hope you're enjoying some quiet time too! Cute photo of your children. I loved The House We Grew Up In. I am going to check out your review. The Beach House sounds good. Thank you. As you saw on the review, I had some issues with The House We Grew Up In, but I'm glad you enjoyed it! Have a good week! While your children are returning to school mine are winding up, there is just two weeks until the end of third time and then after a three week break they will be back for the final term.